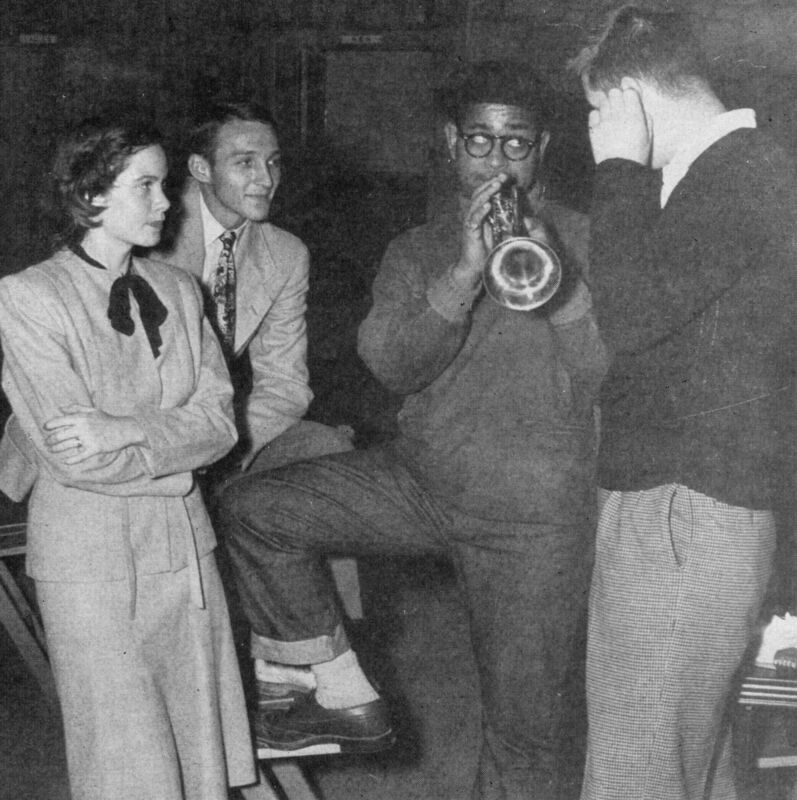 In one of the most spectacular, and possibly strangest, moments in Wake Forest’s holiday history, music legend Dizzy Gillespie bounded off a Greyhound bus on Owen Avenue to play an impromptu jam session at the town’s Community House just days before the 1948 Wake Forest Community Christmas Dinner. It was the last week of November, time to ring in the holiday season. Although still a new tradition, the annual Christmas Dinner was extremely popular; volunteers had started it the year before to give returning World War II veterans a warm welcome home and it was fast becoming a seasonal favorite. Now the civic clubs were once again ready to decorate the Community House with evergreen garlands, table centerpieces, and a large Christmas tree. But they couldn’t do it this particular afternoon—not after the historic entrance of Gillespie and his entire 18-piece jazz band. In those days, Gillespie was a young trumpet virtuoso with an improvisational bebop style that made him the most controversial figure in American jazz. He was traveling on tour between West Virginia and Raleigh, and a group of Wake Forest College students who called themselves the “Friends of Jazz” had invited him to take a break near campus. Somewhat surprisingly, he accepted. It was a cold, rainy day when the bus drove into town on Highway 98, sloshed through mud to the Community House, and parked at the curb. Gillespie stepped out, dressed in a turtle-neck jacket, blue jeans, ostrich leather shoes, and a French beret. The students weren’t sure what to make of him. But he spoke in an easy, interesting way and, once inside the building, he quickly transformed that gray November afternoon into something extraordinary. Of course, Gillespie was a legend in the making. But that’s not the only reason his visit to Wake Forest is worth remembering. His concert for a handful of students was a special moment of shared appreciation and fellowship, the same two things that make the Wake Forest Community Christmas Dinner a cherished and longstanding tradition. The very event that was held a week after Gillespie’s visit to the Community House still happens every year, and it still remains Wake Forest’s best way of welcoming the holidays with friends and neighbors. The 67th Annual Wake Forest Community Christmas Dinner will take place on December 1st at 6:30pm at the Forks Cafeteria, 339 S. Brooks Street. The menu will include roast beef, fried chicken, scalloped potatoes, carrots, apples, green beans, and a dessert bar. Committee Chair Carolyn Coordes will give away door prizes, and local civic groups will decorate tables with seasonal floral arrangements and centerpieces. There will be a performance and holiday sing-a-long led by 12-year-old vocalist Logan Harrison, the invocation will be offered by the Reverend Dr. Enoch Holloway of Friendship Chapel Baptist Church, and Wake Forest Mayor Vivian Jones will recognize the winners of the town’s Citizen of the Year, Organization of the Year, and Peggy Allen Lifetime Achievement awards. Tickets are $15 and available through local civic clubs and locations including the Forks, the Chamber of Commerce, and the Wake Forest Historical Museum. This entry was posted on November 20, 2014 by wakeforestmuseum in Old Campus History and tagged Chano Pozo, Christmas 1948, Dizzy Gillespie, Friends of Jazz, Harold Hayes, Wake Forest Christmas, Wake Forest College, Wake Forest Community Christmas Dinner, Wake Forest Community House.